For me, two angels made this frankly disappointing evening worthwhile. First, there’s Hans Spialek, the original orchestrator, whose work—resurrected here after many decades—is as gorgeously diaphanous and bubbly as anyone could want. The second is Guest Music Director Rob Fisher, who conducted the uneven score with the loving expertise he brings every time we’re lucky enough to have him at the podium. In this, Fisher was, of course, immeasurably supported by the Encores! Orchestra (here, literally a Band of Angels). From overture, to entr’acte, to dance interludes, to curtain call/exit music—when these two angels were front-and-center, it was magical. And then there was the rest of I Married an Angel. Even by the often-rickety standards of 1930s musicals, this Rodgers and Hart show raised more questions than it answered. In that spirit, from here on I’ll handle this review as a series of questions that jumped into my mind as I was watching. With any luck, they’ll ultimately give you some sense of what was on stage. For simplicity, forthwith I’ll shorten the title to IMAA; and I’ll also eliminate the annoying exclamation mark that’s part of the Encores’ official brand, especially since there wasn’t much excitement here. I wish I could tell you. Cavorting rich people in glamorous locations. A soigné bachelor resistant to marriage unless he can find an angel (because the only other kind of female, apparently, is a tramp). Lo and behold: here she is! But it’s not so easy, since said angel, though charming, is gauche and filterless and manages to insult nearly everybody. Oh, and there’s a run on a bank (don’t ask me why), and in the end, apparently everyone has learned something (don’t ask me what). Why would Encores do it? Nominally, to pay tribute to George Balanchine, the original choreographer, on this, the 75th Anniversary of City Center, which was also the first home of New York City Ballet. 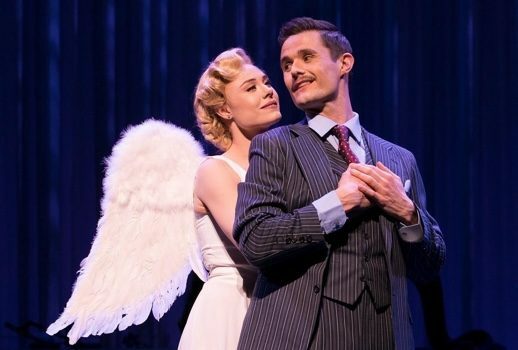 In addition, it’s a Rodgers and Hart score that’s almost never heard, and Encores had Joshua Bergasse to choreograph and (probably more to the point), his wife, Sara Mearns—one of City Ballet’s finest dancers—to star. Was this really a hit once upon a time? The stats suggest yes, at least moderately. The Broadway production of IMAA, which opened in May 1938, had 338 performances on Broadway. (For context, consider that the original Anything Goes ran 420 performances, Babes in Arms ran 289, and Girl Crazy ran 272). Could IMAA have looked like this originally? This was the biggest shock to me about IMAA—even the music and lyrics are largely second-tier. Hart’s contribution is especially weak—apart from “Spring Is Here,” the one song that became a standard, there’s little of either his signature wit or poignant insight. The show isn’t Rodgers’ finest hour either. Again, putting aside “Spring Is Here,” to my ear the only other first-rate song is “I’ll Tell the Man in the Street.” Interestingly, neither of them is featured in the show as strongly as the title song (which I hear as fairly weak), or a few undistinguished ones. Balanchine’s original is lost, sadly, so we can’t compare. But I found Bergasse’s work very disappointing, made up largely of predictable ballet step combinations seen front-on, with few angles or surprises. Despite having Mearns—a glorious ballerina by any standard—Bergasse did better with the tap numbers, though they weren’t near the best of what other choreographers have done in past Encores’ shows. Again, there’s little evidence left of the 1938 IMAA—but I’d have to think its cast hit all the benchmarks. Dennis King and Vivienne Segal have left souvenirs of their work that illustrate their gifts (his as a handsome leading man with a lustrous baritenor; hers as a strong soprano and marvelously dry comedienne). As for the title role, Norwegian ballerina Vera Zorina was exceptionally glamorous and “continental.” She’s captured on film in Louisiana Purchase, where her acting is more than passable, and her elegance pretty jaw-dropping. But what about the Encores’ cast? There’s the rub. Maybe it was the weakness of the material… or maybe Bergasse’s shambling, nearly invisible direction.. but there was a general desultory pall over the event. Mark Evans and Nikki M. James (in the King and Segal roles respectively) found little to work with in the characters, and neither sounded idiomatic or stylish in their numbers. Mearns radiates sunny good will—she’s a girl next door, rather than an exotic beauty—but the acting was largely a blank slate. Among the others, Philip Attmore and Hayley Poschun made the best case for the material, but even they often seemed stymied. Is IMAA more offensive today than it was then? Maybe, but the show is so inchoate it’s hard even to see what that would be. For sure, the attitudes toward women are reductive and stereotypical. It is for me. Frankly, I can’t imagine there’s a future for IMAA. If we’re lucky, the show will get a cast recording that preserves the score (and Spialek) for future generations. But if that doesn’t happen, it won’t be a tragedy.